Buy 2005 RCM Year of the Rooster Silver Coins | ?? 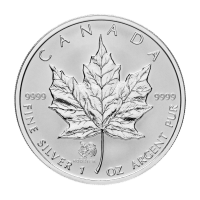 1盎司2005鸡年加拿大枫叶密印银币 Minted by the Royal Canadian Mint in limited quantity and issued annually since 1988, the Canadian Silver Maple Leaf coin's face value is the highest among silver bullion coins at CA$5 and is the first minted coin depicting the latest official likeness of the Queen. This coin features a limited privy mark for the Year of the Rooster. The obverse depicts the effigy of Queen Elizabeth II (year of issue and 5-dollar face value are also shown). As with all Canadian Silver Maple leaf coins, the 2005 Year of the Rooster design includes the series' hallmark assurance: "Fine Silver 1 oz Argent Pur" on the leaf face and adds the dragon privy mark on the bottom left side of the leaf. These superb quality releases are perfect for people born in "rooster" years - 1933, 1945, 1957, 1969, 1981, 1993 and 2005 - who are regarded as honest, bright, communicative, ambitious, capable and warm-hearted. This series moves fast and makes a memorable gift - get your 2005 Canadian Silver Maple Leaf Year of the Rooster Privy coins today.